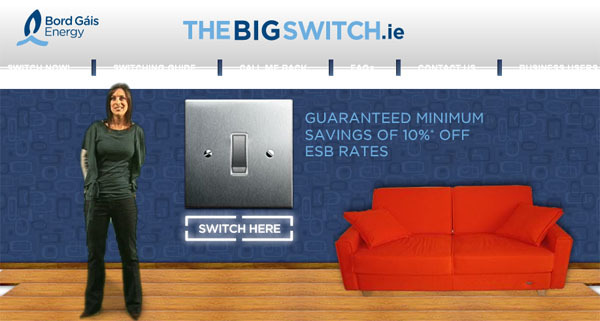 Bord Gáis Big Switch was one of the most successful campaign in Ireland. They integrated advertising, marketing and PR campaigns for this project and their use of Google Adwords was noticeable which proved to be a key element to their success. Bord Gáis objective was to get into Ireland’s residential electricity market and developed a site that would allow people who had already made the decision of switching making it a quick and as easy process, but also allowing people who didn’t have the time to switch or didn’t have the information needed to switch on hand, to schedule a reminder or call back, and finally, help people (who were as undecided) to find out more information on the offer and let them calculate their own potential savings. They generated online traffic from extensive media coverage including TV, print, radio advertising, sales promotion and online marketing. The Google AdWord campaign was aiming to capture all potential traffic during the launch period generated by the PR coverage. Google pay per click (PPC) campaign was very important because the website would not have an immediate presence in Google as organic. To ensure the effectiveness of their ad, they created a series of large-scale campaigns featuring hundreds of ad texts and thousands of keywords with a consistent message, a call to action and their URL. On the day of launch the site had over 27,000 unique visits and over 4,000 online switch applications. On the following day the site had over 27,000 unique visits and over 5,000 online switch applications. Within 30 days of launch, Google AdWords advertising generated over 30,000 sign ups and their online channels measurement showed a conversion of over 100,000 customers via the BigSwitch.ie in just 4 months. Bord Gáis’s campaign effectiveness was also ensured by constantly analysing the traffic to the website. By doing so, they could see which keywords were most effective in attracting potential customers, what pages on the website were being viewed and what conversion rates were being achieved. They changed the keywords used to ensure that they achieved the maximum return on their advertising spend. Their TV advertising had an immediate effect on search volumes and site traffic, indicating that more people are surfing the web while watching TV, due to this, customers are already searching for what the advertiser offer and they are more likely to engage with ads by reading and clicking on it. Posted on November 8, 2012, in Advertising and tagged advertising, Digital Marketing, google adwords, online advertising, text advertising, the big switch, WEEK 4. Bookmark the permalink. Leave a comment.